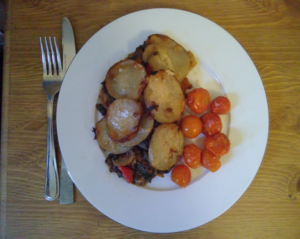 Because we all love a good challenge ... the latest post in a series on food waste by Tearfund. 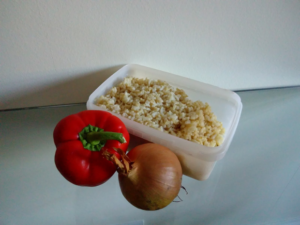 We asked Jack Wakefield to see how much he could reduce his food waste over one week and keep a record of how he got on. Here’s the unabridged highlights and lowlights of his week without waste. When I was first asked, I didn’t really have an answer. Do I throw lots of food away, or am I doing better than average? To be honest, I just didn’t think it mattered. I care about how my lifestyle affects the environment, but food waste hadn’t really featured in any of these thoughts or conversations before. Did it really matter if I composted stuff instead of eating it? Recording my food waste was an eye-opening experience. And learning of the huge contribution food waste makes to our greenhouse gas emissions made me sit up and pay attention. Turns out, it really does matter! Today was a clear-out day for me. Lots of food was starting to turn, in both the fridge and the cupboard. Usually lots of this would be thrown in the food waste bin, but today I was determined to start off well. First up, a few tomatoes were going soft after four days in the fridge. I roasted them with a bit (or a lot) of oil and served with a meal I’d frozen earlier (in true Blue Peter style). Mmmmmmmm… you can’t beat a good hot-pot, this time with a delicious mushroom, lentil and spinach filling. After consuming the tomatoes, it was time to sort some manky-looking brown bananas. 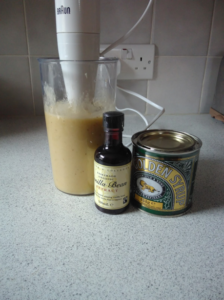 A quick bit of chopping……some blending, a dollop of syrup, and splash of vanilla essence from the cupboard. A few hours freezing of freezing later and then voila – I’d made my own banana ice cream! We do saying goodbye with style at the office, and on this particular occasion the supply of cake was huge. We did a pretty good job getting through the mountain of treats, but the picture is actually the left-overs, not the huge quantity we started with. Thankfully it didn’t go to waste. Here’s a photo of it making a second appearance as dessert for a garden party that evening and it reappeared in various locations around our desks the next two days too! 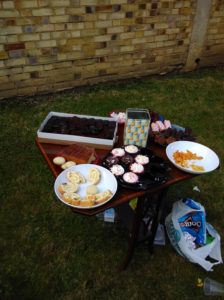 The garden party had a lot of waste – left over fruit for Pimm’s especially. Sadly we put most of this into food waste bins. It’d been out all evening and there was far too much for us to eat. In the past, I would have just be happy seeing we were using those little green food waste bags, satisfied that it was being composted rather than sent to landfill. However this time it felt different. Without exaggerating, it felt like an injustice. Keeping track of my waste through the week taught me to value food so much more, not taking it for granted but being thankful for each little bit, recognising the huge amounts of labour involved to get it to me. So seeing so much fresh food going to waste was hard. I thought of stories I’ve heard of families in Malawi, South Sudan and Somalia struggling to find enough food to survive. I thought of the hard work of farmers around the world and the whole industry involved in bringing us these strawberries, cucumbers and cake. I thought of the dangerous greenhouse gases generated during food production for us to then throw it all away, and the impact this kind of lifestyle has on the world’s poorest. It was a sobering moment. So far, I felt pretty good. Although shocked by how much we threw away the day before, I thought personally I’d made some great progress! Continuing on the waste-reducing activities, I felt like I was doing my bit by having the rest of this divine chocolate for breakfast, and snacking on some left-over strawberries during the day. Who knew slightly soft strawberries had so much flavour? 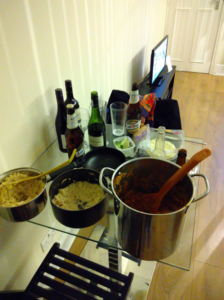 In the afternoon, I shopped (only for what I thought I needed) and had a few friends round for dinner. There was a lot left over though. I was desperate it didn’t go to waste. We boxed up portions, popped some in the fridge and friends took away portions for lunch the next day. Everything that was left was frozen in previous takeaway cartons and Tupperware. Despite boxing up so many portions the night before, there was still a lot of rice left over. My guess at quantities was way off! The following day, I rummaged around for some extra ingredients to make use of all the rice. 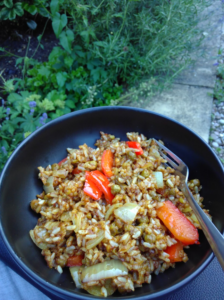 A leftover pepper and spare onion did the trick, I then added some peas and soy sauce to make a delicious fried rice. The weekend was coming, and I was determined to finish the week well. Having planned to go away for the weekend I needed to make sure nothing got left behind. 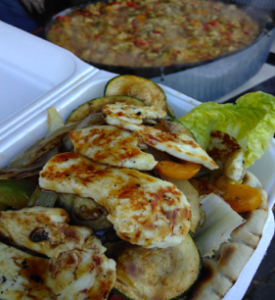 Hubbub estimate that £12 million of food goes to waste in the first week of people’s summer holidays each year. To make sure this didn’t happen to me, breakfast on the train was a sad looking roll and an apple I’d been carrying around all week. I then relaxed, put on some music and smiled, feeling good that nothing was going to waste while I was away. While away, I ate out and joined a BBQ – both were delicious but it got me thinking about how much goes to waste commercially. No one really knows because supermarkets and other companies don’t have to publish the data of how much gets thrown away, but the best estimates say a third of all food produced globally never gets eaten; it goes to waste or is damaged or lost in the process. Through the week I took a few extra steps to reduce the amount of food I wasted and learnt to value what I had so much more. To appreciate the labour, resources and energy that had gone into producing what I had. I’d recognised on a deeper level my responsibility as a steward to take Jesus’ words more seriously when he feeds the 5,000 and asks his disciples to ‘gather up the pieces, let nothing be wasted’. There was just one slight problem. In the fridge was a gross looking bag of salad. It’d been sat there for most of the week and was far from edible anymore. There’s still a lot to learn, but I’m thankful to have begun the journey! Jack is a theology graduate, stumbling into adulthood and working with Tearfund Act. Are millennials to blame for the food waste mountain? // Two thoughts from a former cynic about the importance of Christian festivals.